This Bleach cube craft paper toy is the Nelliel Tu Odelschwanck (Transformation). 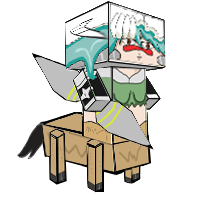 This is the transformation version for the character, for more infomation of the Nelliel Tu Odelschwanck and papercraft visit here: Bleach – Nelliel Tu Odelschwanck Cube Craft Free Paper Toy Download. This papercraft is designed by blackignus.